Don’t Hold Back – FLY!!! Sign up for our Newsletter for new blog posts, tips & freebies. Let's stay updated! Hello Friends! Welcome to a new week. The concept of ethics cannot be overemphasized. Unethical behaviors and corruption are part of the moral degeneration that is sweeping across the entire world. Corruption remains perhaps the biggest threat to the developmental process of anybody. In our daily transactions, we feel an obligation to consider not only our personal well-being, but also that of other persons. Ethics is, therefore, a code of behavior that a society considers moral and appropriate for guiding our relationship with one another. The issues at stake here include honesty and integrity, as well as, fair, open and straightforward dealing. It involves conforming to the golden rule of doing unto others as you would have them do unto you. 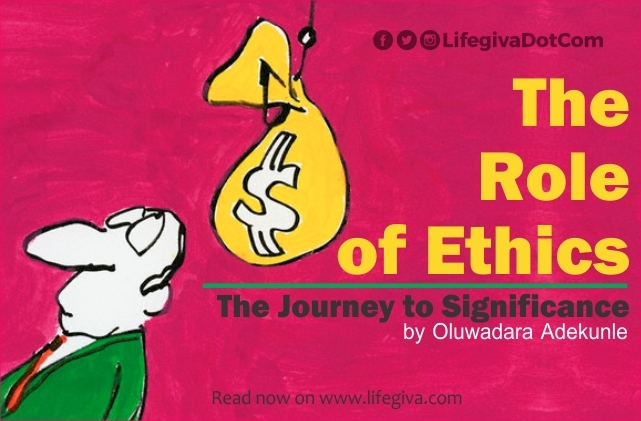 Ethics is knowing the difference between what you have a right to do and what is right to do and significance is measured by the choices we make on the journey of life. You must take them seriously enough to override any human rationalization, weakness, ego, or personal faults. When all else fails, you will always look back to these core values to guide you. Unfortunately, life is not that easy and there’s always disagreement about what values should reign supreme. Ethics concern an individual’s moral judgments about right and wrong. Decisions taken within an organization may be made by individuals or groups, but whoever makes them will be influenced by the culture of that organization. The decision to behave ethically is a moral one; employees must decide what they think is the right course of action. Have you ever found yourself in a situation where you were tempted to compromise your integrity and honesty for success? You need to always choose the right path, it’s always good to choose the ethical pathway. Discussion: How Physically Involved Should Dating Partners Be? Let’s Settle This Once And For All – Is Kissing a Sin? Confucius on Don’t Hold Back – FLY!!! We are committed to blogging practicable but scriptural wisdom for everyday living.